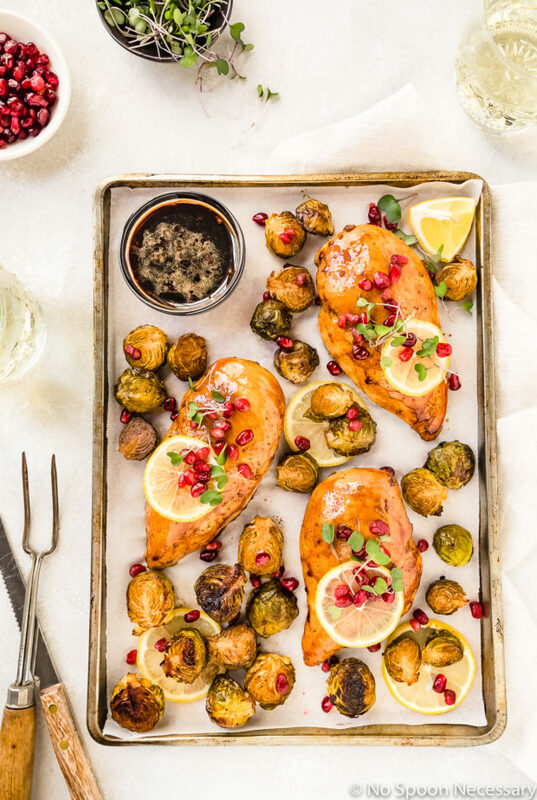 This Sheet Pan Honey Balsamic Chicken & Brussels Sprouts only requires 8 ingredients and 35 minutes, from prep to finish! Loaded with sweet and sour flavors, plus easy to prepare, this delicious one-pan meal is a weeknight dinner winner! This post was originally published in February 2018. I edited the photos and updated the post below to include more information about this baked honey balsamic dinner. Plus, I added a recipe video to show you how easy these sheet pan meal is to make! Happy first day of February, friends! Okay, so I know, I know, I knooooow a bunch of you are probably thinking “ummm you’re forgetting about a MAJOR holiday that comes before cupid’s day, lady”. It’s just that my team lost in the playoffs, so I’m moving on. Now let’s get back to Valentine’s day. Mmmm’kay? 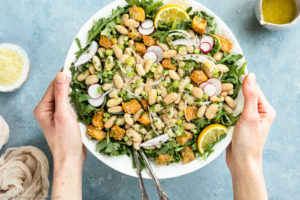 Today’s meal is perfect for those of you that are celebrating the holiday as a family, or those of you who don’t want a fussy meal. Shoot, it’s even perfect for those of you who aren’t celebrating at all and simply want a delicious meal that’s easy on the eyes… ANY day of the week. 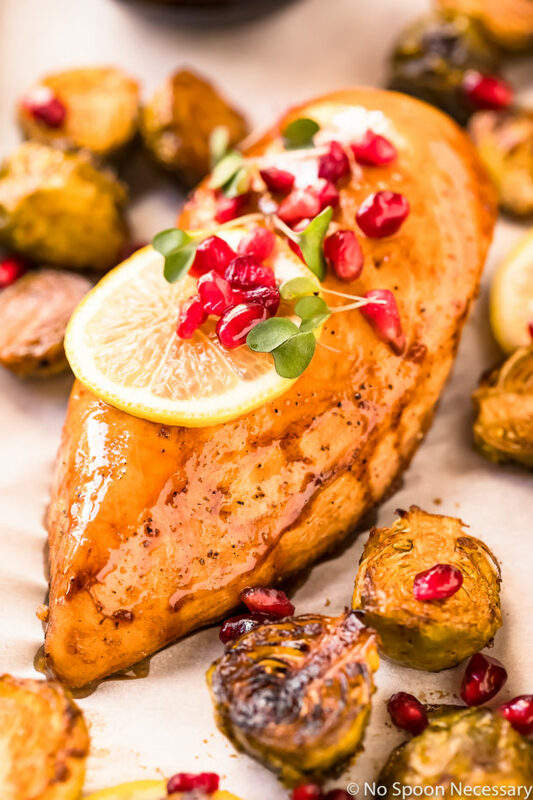 Tender chicken breasts coated in a tangy, sweet balsamic pomegranate sauce served with tender-crisp, caramelized brussels sprouts tossed in honey and balsamic; then topped with jeweled pomegranate arils, tart lemon wedges, and fresh micro greens. Oh, and did I mention the chicken marinade doubles as a silky, smooth, finger-lickin’ good dipping sauce? Essentially, this easy honey balsamic glazed chicken situation is stupid easy to prepare, yet fantastically flavorful. How to make honey balsamic marinade and sauce? 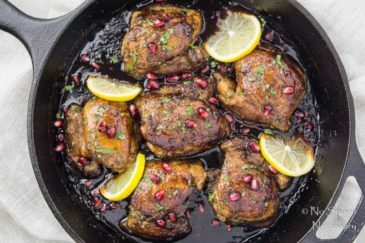 To make a honey balsamic marinade, mix together high quality balsamic vinegar, honey, pomegranate molasses, minced garlic and lemon juice. Season the marinade to taste with salt and pepper. Honey balsamic marinade can be used on any cut of chicken – thighs, breasts, drumsticks or wings. To use honey balsamic marinade, simply add chicken to a large zip-closure bag and pour on the marinade. Seal the bag, transfer to the refrigerator and allow the chicken to marinate for at least 30 minutes, or up to overnight for the most flavorful, moist chicken. If you want the honey balsamic marinade to double as a sauce for serving, reserve some of the marinade before adding it to the chicken, making sure to avoid cross-contamination. How to make honey balsamic chicken? Mix together the ingredients for the honey balsamic chicken (listed above) and allow the chicken to marinate in the fridge at least 30 minutes, or up to overnight for the most flavor. Place the marinated chicken on a large, rimmed baking sheet lined with parchment paper or aluminum foil. Bake the chicken in an oven preheated to 425 degrees Fahrenheit for 20-25 minutes or until the chicken is cooked through. Tips for the best baked honey balsamic chicken? You can substitute boneless skinless chicken thighs for breasts if you prefer dark meat. While I recommend marinating the chicken for at least 4 hours or up to overnight for the most flavor, if you are in a hurry you can let the chicken marinate on the counter for 15-20 minutes while the oven preheats. If the reserved pomegranate molasses sauce is not thick enough for your liking, place the sauce in a small sauce pot and simmer over medium-low heat for 5-10 minutes. When brushing the chicken breasts with half of the reserved marinade in step 5, make sure you do NOT cross contaminate. Pour the reserved marinade into two separate bowls. Use one for brushing the chicken and the other for serving as a dipping sauce. What to serve with Honey Balsamic Chicken? 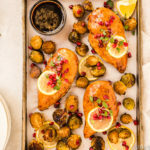 How to make a sheet pan chicken dinner? 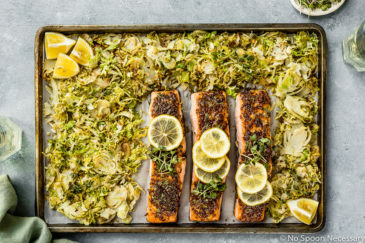 Sheet pan dinners are great option for busy weeknight dinners. With a solid sheet pan, a few chicken breasts (or thighs), a generous serving of vegetables, a few pantry staples and minimal clean-up, you can have a delicious dinner on your table in no time! The first step is to make sure you are actually using a sheet pan. A sheet pan is made from stainless steel, or aluminum, and has a deep rim around the edge. Make sure you avoid using a flimsy, non-rimmed baking sheet. If you are halving the recipe, you can substitute a jelly roll pan, which is simply a smaller version of a rimmed baking sheet. 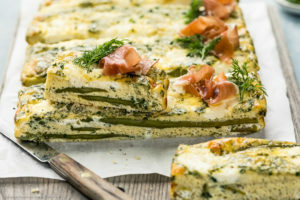 However, avoid using a jelly roll pan if you are making the recipe in its entirety, as over filling the pan with ingredients will cause the chicken and vegetables to steam, instead of roast. Pro tip – if you are using skin-on chicken thighs, instead of breasts, place the sheet pan in the oven while it preheats. When ready to roast, place the chicken thighs, skin side down, on the hot pan and proceed with the recipe. Using a hot sheet pan to roast the thighs will result in crispy skinned thighs. 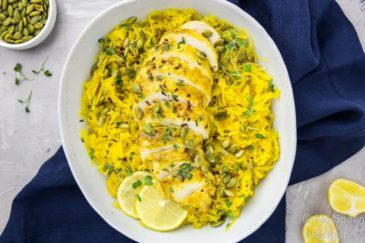 How long do you bake boneless skinless chicken breasts? When your oven is preheated to 425 degrees, it should take approximately 20-25 minutes to bake chicken breasts. The actual amount of time to bake chicken to the proper internal temperature will depend on the thickness of your chicken and the strength of your oven. To ensure even baking (and avoid dry, rubbery chicken), use a meat mallet to gently pound the chicken breasts to an even thickness. How to tell if chicken is fully cooked? Boneless, skinless chicken breasts need to be cooked to an internal temperature of 165 degrees F.
For the most accurate results, insert an instant read thermometer into the thickest section of the chicken breasts to check if chicken is at 165 degrees. If you are a more skilled cook, you can also tell when chicken is cooked by touch. The meat should feel firm to the touch, rather than soft and rubbery. 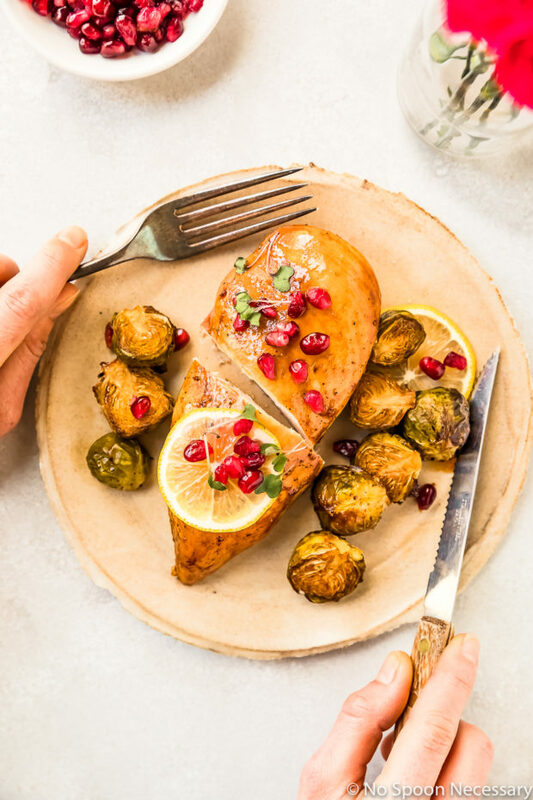 Only EIGHT ingredients and 35 minutes stand between you and this flavorful Baked Honey Balsamic Chicken & Brussels Sprouts! So what are you waiting for? Print the recipe and go get ya some, friends! Until next week, cheers – to easy eats! 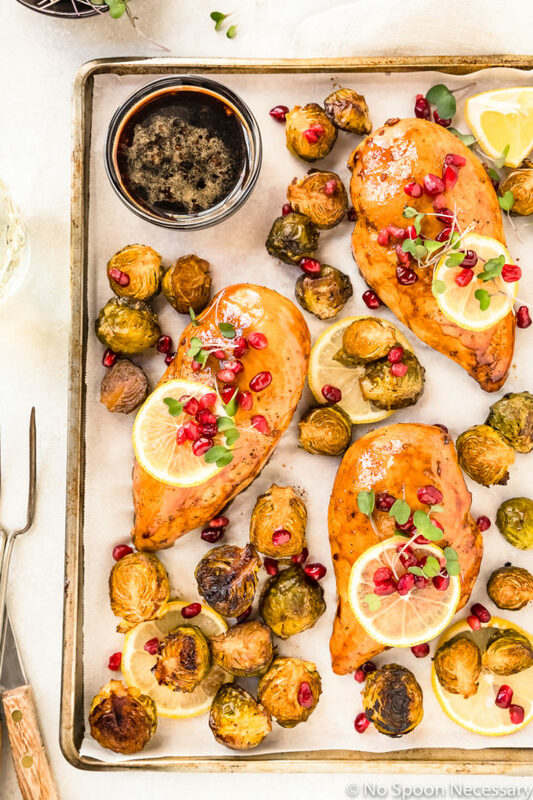 This Sheet Pan Honey Balsamic Chicken with Brussels Sprouts only requires 8 ingredients and 35 minutes, from prep to finish! Loaded with sweet and sour flavor, plus easy to prepare, this delicious one-pan meal is a weeknight dinner winner! Make the Marinades: In a medium bowl, combine molasses with ¼ cup vinegar, ¼ cup honey, garlic, and lemon juice. Season with salt and pepper to taste (this mixture is for chicken). Whisk to combine. In a small bowl combine the remaining vinegar and honey (this mixture is for brussels sprouts). Whisk to combine. Set both aside. Marinate the Chicken: Place the chicken in a large, zip-closure bag and add HALF of the molasses mixture (about heaping 1/3 cup), reserving the remaining mixture for brushing and serving*. Seal and transfer to the refrigerator (up to overnight) to marinate. For Baking: Line a large, rimmed baking sheet with parchment for easy clean up. Place the marinated chicken on half the prepared baking sheet*. Add the brussels to the other half of the pan and toss with the olive oil. Season the chicken and brussels generously with salt and pepper. Bake: Transfer to the oven and bake for 20-25 minutes, or until the chicken is cooked through and the sprouts are caramelized. Halfway through baking, brush the chicken with HALF of the reserved marinade* and rotate the baking sheet. For Serving: Remove from the oven and drizzle balsamic honey mixture over brussels sprouts. Transfer to chicken and brussels sprouts to serving dishes. Garnish with lemon, arils and micro greens if using. Drizzle with reserved molasses sauce. Enjoy! Great tips on cooking chicken Cheyanne! This chicken looks super juicy and I love the addition of pomegranates. Definitely festive for Valentine’s Day! Looks seriously delicious lady! 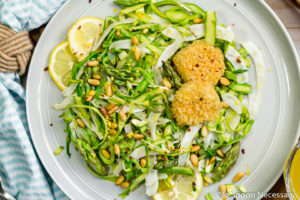 I hate brussels sprouts but somehow your recipes make me want to eat them which is just impressive. I’m all about the sheetpan dinner on weeknights and we’re kind of in a rut, so your timing is perfect! Some of my favorite flavors on one pan. Not much of a football fan, but I love game day food (obviously). 😉 So checking out your other yummy recipes too. I just love the flavors in this! especially the pomegranate seeds! And I need no celebration to try this. Maybe I’ll just celebrate the weekend. I’ve really got to start making more sheet pan dinners instead of running around like a chicken with my head cut off to get everything ready (ahem…and photographed) in time. The Super Bowl? Doesn’t exist in my life! :) But I don’t mind some Valentine’s celebration, and I certainly don’t mind having this succulent chicken. 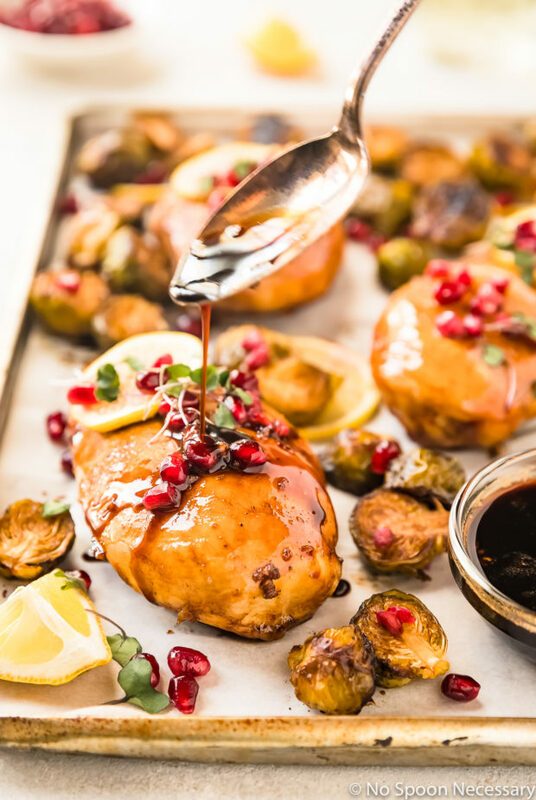 Honey, balsamic, pomegranate, and Brussels sprouts – perfect combo, Chey! 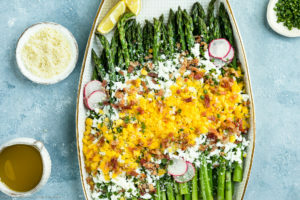 Nothing can beat a good sheet pan dinner, of this I am convinced. And this one sounds fantastic! I basically live for Brussels :). I’m sorry your team lost in the playoffs; I know that feeling too well. Happy almost-Friday, Chey, and have a great weekend! I’m not thrilled about who’s in the Super Bowl either. I’m pulling for the Eagles even though they’re more than likely going to lose! 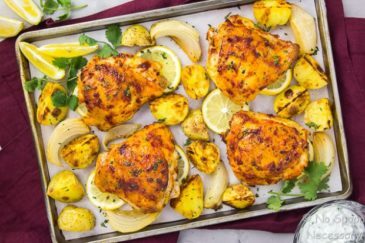 I do love sheet pan dinners and these flavors sound amazing and perfect for Valentine’s Day or any busy weeknight! This looks delicious Cheyanne! 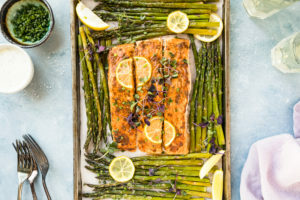 I love easy sheet pan dinners Chey, and I’m always looking for more to add to my list! 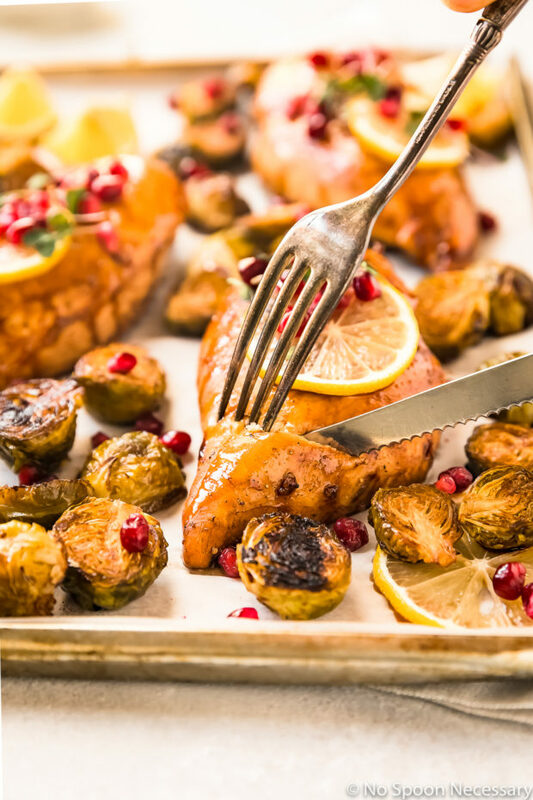 I love the brussels sprouts and of course those yummy pomegranate arils! So flavorful. The marinades sound awesome too! Happy almost the weekend! Such a wonderful meal! I love that marinade…what can I use instead of pomegranate molasses? How about balsamic syrup? Hi Angie! You should be able to find pomegranate molasses in the ethnic isle of most major grocery stores. There isn’t really any great substitute, so I would recommend making some yourself (there are tons of great recipes out there), or if you absolutely need a substitute, I would recommend cranberry juice concentrate as a last resort. 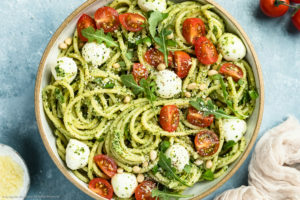 Using balsamic syrup would just add more balsamic flavor to the dish, and since there is already a ton of that flavor happening here, I wouldn’t recommend going that route. 😉 Cheers, girlie! I’m not into football at all, but I do like the super bowl for the food and commercials! And Valentine’s Day, it’s just kinda there. This is the most beautiful chicken that I’ve seen, Cheyanne! I love the balsamic pomegranate combo. Sound delicious and perfect for celebrating Valentine’s Day! Gotta remember this yumminess! Pinned!